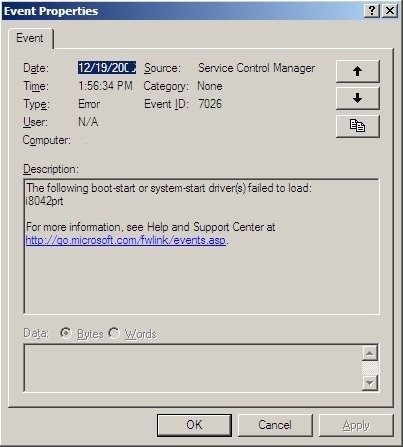 An IBM NetVista workstation running Microsoft Windows 2003 SP2 consistantly has an error at system-start. The service is i8042prt and the Event ID is 7026 with the error “The following boot-start or system-start driver(s) failed to load: i8042prt”. I found a reference to this error from a user with a HP Proliant ML150 G2 server. According to Microsoft, the i8042prt subkey stores data for the i8042prt driver. The i8042prt driver controls the keyboard and PS/2-compatible mouse for the Intel 8042 controller. To resolve the error message is to disable the i8042prt by changing the dword value of Start from 1 to 4. This will change onboot_service to disabled.